What performance boost will Intel's next chips deliver? Do you want more power-efficiency or CPU horsepower with your next PC chip? The merits of each have propelled an interesting debate among those who want more performance or longer battery life in their PCs. But raw CPU performance drives the ongoing rivalry between AMD and Intel. Intel wants to continue to deliver 10 to 20 percent performance improvements with chips based on the upcoming 10-nanometer and 7-nanometer manufacturing processes, company CEO Brian Krzanich said this week. Some critics may deem those numbers to be incremental, which is why AMD’s upcoming Zen PC chip is getting attention. The chip will deliver 40 percent improvement in instructions-per-cycle, a metric related to CPU performance. Chip makers haven’t historically seen the big performance boost coming in Zen, AMD’s Chief Technology Officer Mark Papermaster has said. Zen was characterized as a “high-performance” chip by AMD CEO Lisa Su at Computex this week. But Intel has different goals, with a larger focus on increasing battery life in laptops and keeping PCs affordable. 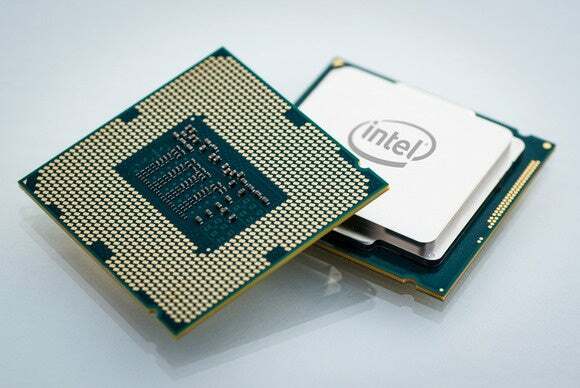 Intel’s priority is to make chips smaller while also reducing power consumption and manufacturing costs. “To me, process leadership is cost-per-transistor and performance-per-watt type of a number, and that’s really where we believe we continue to have leadership,” Krzanich said at the Bernstein Annual Strategic Decisions conference in New York on Wednesday. Intel is looking at rolling out new manufacturing technologies ahead of rivals, which will help achieve a balance between manufacturing cost and performance-per-watt. These changes will give Intel a continuing manufacturing advantage over rivals, Krzanich said. Intel makes its own chips, unlike AMD, which has its chips made by contract manufacturer Globalfoundries. Intel’s other competitors include Samsung and Taiwan Semiconductor Manufacturing Co. (TSMC). “If you also talk ... to competitors, they say there’s going to be marginal improvements in performance on 10-nm, they are going to go for 7-nm for performance. We plan to have a consistent performance improvement of 10 percent to 20 percent in each one of these nodes,” Krzanich said. For decades, Intel has used Moore’s law as a guiding star to cram more transistors while reducing the size and power consumption of chips. From doubling the transistor count every two years—which was key in driving CPU performance—Intel’s interpretation of Moore’s Law is now related more to the economics of chip making, which has helped advance PC chip technology while keeping prices low. Intel is now advancing manufacturing technology every three years instead of two years. That’s partly because chip-making has become more complex, and it also reduces the frequency of Intel’s investment of billions of dollars to build new factories. Intel’s first 10-nm chips code-named Cannonlake are expected to be released in the second half of 2017. Jim McGregor, principal analyst at Tirias Research, contested Krzanich’s claims of performance improvements in chips made by rival manufacturers. As Intel suggests, initial performance numbers from rivals may suggest marginal performance improvements, but as the manufacturing process matures, the performance improvements may get a serious boost, McGregor said. Something similar happened to Intel, which struggled with its 14-nm process initially. But as the process matured, the company saw performance gains on its chips. Samsung may be the first Intel competitor to jump to 10-nm. TSMC says it will start making 10-nm chips this year. But it’s also possible that AMD won’t be able to replicate the 40 percent instructions-per-cycle improvement in Zen on successor chips. AMD is moving to a 14-nm chip with a 3D transistor structure, which is a radical change from the company’s older chips. The ability to boost performance on the 7-nanometer node will come with advanced manufacturing tools like EUV (extreme ultra violet), which makes it possible to etch finer features on chips using ultraviolet light at a shorter range. The 7-nm process is considered a major manufacturing upgrade, though EUV has been delayed for years and is still considered a challenge for manufacturers to implement. Intel has delivered many chip manufacturing breakthroughs over the years. It implemented strained silicon in 2003, high-K/metal gate in 2007, and tri-gate transistors, also known as FinFET or 3D transistors in 2011. It is looking to use exotic materials like gallium nitride—which is a better conductor—to supplement silicon on chips. Krzanich is concerned about developments at competitors but also confident Intel will maintain its manufacturing edge. “I’m comfortable that at least over the next two nodes we know how to stay ahead,” he said.